A slippery yoga mat is one of the worst and most dangerous things you can experience in a yoga asana practice. We all want a sufficiently cushioned, durable, non-slip yoga mat that'll allow us to practice postures without slipping and falling on our faces. 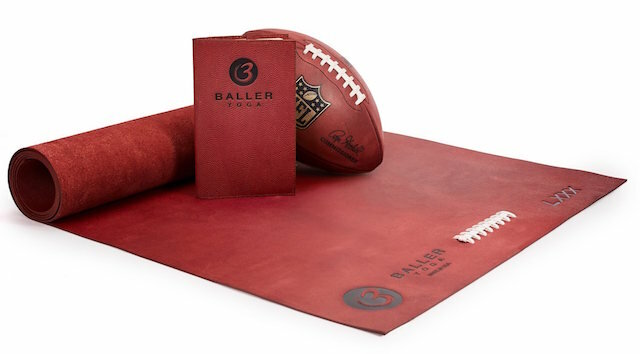 This is what prompted LA-based company Baller Yoga to create a yoga mat made of 100% pebble grain football leather—it's a material with good grip and it holds up well against wear and tear. Baller Yoga founder Cedric Yau said he got the idea when he was on a yoga retreat in Bali and was frustrated with the slippery mats. He wanted a mat that has a solid grip, minus the stickiness—and that's when he realized football leather has that exact quality and could make for great material for yoga mats. So Where's the "Controversy" Coming From? Well, aside from the fact that the premium leather-made yoga mat costs $1000 (which is way beyond the typical yoga mat price range of $20-$150), the leather material used for making the mats also does not sit well with vegan yogis and ahimsa-practicing community. Yau told The Guardian, “The leather sourced is a byproduct of the meat production industry. We do not believe in killing animals for their skin.” While Yau admits that they do get flak from the vegan community, he also says that the yoga mat is aimed more specifically for athletes. They currently offer the leather yoga mats in four colors (red, black, natural sand, and silver) and three sizes, with the smallest ones (69.5" x 24") retailing for $795 and the 80"x26" mats for $1500. You can learn more about Baller Yoga and their yoga mats here. What do you think? Would you buy and practice on a yoga mat made of leather? Sound off in the comments below.